Amazing staff, maintenance ,grounds keepers,neighborssubmitted by Sherri W. - May 18, 2016 |Recommended: YesWe are new to the area and have been living here 2 months now. We absolutely love it here. The ladies in the office have been amazing from day one They are knowledgable sweet, friendly and will do everything they can to help. The maintenance staff are prompt,dedicated, professional very respectful and accommodating. 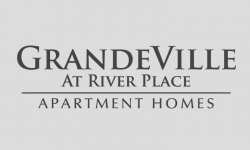 Grandeville at Riverplace is like a private community where you actually get to meet and know your neighbors, the pool and outside grilling areas and covered cabanas make it like being at a resort vacation spot. I love the propertysubmitted by Laura L. - Apr 13, 2016 |Recommended: YesManagement is extremely polite helpful and just plain awesome Very happy with the way things are done.